Concerts, Music, Clear & Safe. 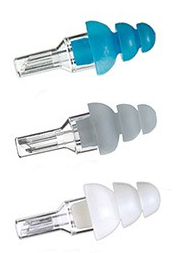 Musician Earplugs are designed especially for musicians, but they are great for all music lovers. Ordinary ear plugs cut off high frequency sound. The natural sound you get from musician ear plugs solves this problem by reducing the volume you hear without distorting the sounds. Musician earplugs are not just for musicians! If you suffer from hyper sensitive hearing (hyperacusis) or you live in a very noisy environment, musician earplugs offer an excellent solution. The earplugs do not interfere with your ability to understand voices or enjoy the full range of sound from the music you hear. They just reduce the volume. Now you can turn down the volume on your world to reduce stress and increase enjoyment in your life. How Do I Know If Natural Sound Musicians Ear Plugs Are Right For Me...? If you need to use your natural sound earplugs frequently or over very long periods of time, we recommend the professional lab custom molded professional musicians ear plugs. These are custom-fitted to your unique ears for the ultimate in performance and comfort. (NRR 32) Mack's Blackout black foam ear plugs are designed for musicians who need protection from bass, cymbal crashes, and other loud noises during practice or jam sessions. They're also excellent for concert-going fans and for use at dance clubs. 3 pairs. (NRR 20) Mack's Acoustic Foam Clear Sound urethane foam ear plugs are the perfect solution when you want to be able to hear the music or people speaking to you, and you prefer to use soft foam ear plugs instead of reusables. An inexpensive solution for musicians, concerts, and more. Three pairs. (NRR 20) Mack's Acoustic Foam Clear Sound urethane foam ear plugs are the perfect solution when you want to be able to hear the music or people speaking to you, and you prefer to use soft foam ear plugs instead of reusables. An inexpensive solution for musicians, concerts, and more. One corded pair with carry case. (NRR 21) Howard Leight by Honeywell Clarity Natural Sound Reusable Ear Plugs offer another excellent choice in the fast-growing category of natural sound ear plugs. We recommend these for protection in environments up to 99 dB, including home workshops, concerts and clubs and for daily wear for those with acute sensitivities to noise. (NRR 20) Mack's Acoustic Foam Clear Sound urethane foam ear plugs are the perfect solution when you want to be able to hear the music or people speaking to you, and you prefer to use soft foam ear plugs instead of reusables. An inexpensive solution for musicians, concerts, and more. Seven pairs with carry case. (NRR 14) QuietEar lets you hear voices, music and other sounds in the voice frequency range, while protecting you from dangerously loud noises. These durable pre-molded silicone earplugs are washable and reusable for months of daily use. (NRR 32) Mack's Blackout black foam ear plugs are designed for musicians who need protection from bass, cymbal crashes, and other loud noises during practice or jam sessions. They're also excellent for concert-going fans and for use at dance clubs. 7 pairs with metal carry case. (NRR 27) Hearos New Rock 'N Roll reusable ear plugs are made with a sharply tapered, 4 flange design to fit nearly everyone perfectly. The extra-long stem features two ridges and a removable plastic stiffener, which together make insertion and removal a snap. (NRR 23) EarAngels are ear plugs that attach to your earrings. With EarAngels, your hearing protection can blend in seamlessly with your favorite pair of stylish earrings. With their clear and simple low-profile design, EarAngels let you easily protect your hearing at concerts and clubs. (SNR 25) Happy Ears provide natural sound hearing protection that won't muffle safe sounds. Turn down the noise of the city so you can listen to the sounds that really matter. Happy Ears offers moderate sound reduction for sleeping, studying, and working more peacefully. (NRR 18) Impact Music and Concert Ear Plugs block dangerous noises while allowing non-harmful sounds like speech and music to pass through to the ear canal without distortion. Great for concerts and clubs, as well as use around the home and shop. Thunderplugs ear plugs are designed for music festivals and concerts, by serious music lovers who know all-too-well what can happen without proper protection from hazardously loud noise. (NRR 11) PartyPlug Ear Plugs from Alpine Hearing Protection feature the silver filters used in the MusicSafe Pro and are intended for the concert and events visitor. Ideal for music events, discos, concerts, dance parties, and all other loud music. (NRR 27) Hearos Rock N Roll Series ear plugs are ideal for high-volume music practice, drumming, and live music. These ear plugs block much more sound than natural sound musician's ear plugs, making them a good choice when protecting your hearing is more critical than clear hearing. Vater Percussion Professional Musicians Ear Plugs feature a tapered, triple-flange design, with an interchangeable filter system that lets you choose the level of attenuation you need for your specific venue. (NRR 11/14) EarPeace HD Ear Plugs build upon the popular original EarPeace High Fidelity design, with an improved ear tip design, two sets of filters to suit your auditory environment, and more available hearing protection for very loud shows, clubs and other venues. (NRR 15) Vibes High Fidelity Ear Plugs for concerts let you seize control over your auditory environment. Be the architect of your own clear and balanced listening experience. Ditch the distraction of uncomfortable noise, enjoy your music, and protect your ears with Vibes. (NRR 12) Hearos High Fidelity Long Term Use ear plugs are designed for those who need musician's hearing protection for hours at a time. The slightly smaller size is more comfortable for long term wear. Provides natural sound hearing protection that won't distort the music. (NRR 12) Hearos High Fidelity Musician's Ear Plugs provide flat attenuation of sound across the frequencies for clear audio. These ear plugs block just enough sound to take the edge off, without making the music you hear distorted or muddy. Ideal for concerts, music students and music teachers. (NRR 15) Comply™ Foam Plugs provide a unique memory-foam tipped solution to help musicians and audiophiles protect their hearing without distorting the music. These foam-tipped ear plugs may be perfect for those who need a musician's ear plug and don't like pre-molded silicone plugs. Alpine MotoSafe Pro Motorcycle Earplugs include two sets of ear plugs with two different noise attenuations, so you can choose less attenuation for city driving and touring, or more attenuation for racing and extended highway riding. Cut the wind noise and hear clearly with these ear plugs for professional drivers. (NRR 12/22) HearDefenders-DF™ natural sound variable noise reduction ear plugs offer a unique set of features that make these breakthrough ear plugs an excellent choice for most situations that call for a natural sound earplug. EarSonics PAD musicians earplugs offer an average volume reduction of about 16 dB without distorting the sound you came to hear. Now available in regular (adult) and small (kid) sizes. Ideal for anyone who wants to protect their hearing in loud clubs and at concerts. (NRR 20) Mack's Acoustic Foam Clear Sound urethane foam ear plugs are the perfect solution when you want to be able to hear the music or people speaking to you, and you prefer to use soft foam ear plugs instead of reusables. An inexpensive solution for musicians, concerts, and more. Tub of 100 individually wrapped pairs. (NRR 5) EARasers musician's ear plugs provide flat fequency response natural sound hearing with minimal noise blocking. The low NRR is ideal for singers and acoustic musicians, and the virtually invisible fit makes these a great choice for any musician, music student, or concert-goer who needs very discreet hearing protection. (NRR 7) Crescendo Woodwind is part of the elite Crescendo line of natural sound musician's ear plugs. Crescendo Woodwind plugs are especially tuned and attenuated for woodwinds and brass. Perfect for acoustic music, jazz, bluegrass, and folk. Discount pricing is available for orders of 10 or more pairs. Please email info@earplugstore.com for pricing. (NRR 16) Crescendo Drummer is part of the elite Crescendo line of natural sound musician's ear plugs. Especially tuned and attenuated for drummers, clubs, and heavy bass. Perfect for heavy metal and rock concerts, amplified music with heavy bass, and music festivals. Discount pricing is available for orders of 10 or more pairs. Please email info@earplugstore.com for pricing. Got Ears?® Snappy™ in-ear isolation earphones are designed to snap right into your full custom musician ear plugs. Snappy is also compatible with more choices in replaceable ear tips than any other earphones, and ships with three sizes of Got Ears? Fat Tips.